We would be glad to assist you with your enquiry? Many people like to think they are experts on turf. It can be confusing to know exactly how to choose, install and look after your lawn, when everyone seems to have such strong opinions based on their own turf. The truth is, while there are some general rules to looking after your turf, some things will depend on the turf type, and the weather. Turn to the professionals and check out our handy guide of what to do and not to do when it comes to your lawn. Choosing your turf is one of the most important choices you’ll make for your home. As such a long-term investment, it’s wise to go straight to the experts who can discuss the best turf to suit the climate and your specific garden needs. Don’t hold back when it comes to watering after your turf is laid. Freshly laid turf loses moisture very quickly. There shouldn’t be a day go by in those first 4 weeks where your lawn isn’t watered. The more you water your newly laid turf, the more likely it is to not only retain its colour, but also establish a deeper, stronger root system in the ground that will keep it alive and looking fabulous for years to come. There’s no need to aerate too often, but as turf becomes denser over time, it doesn’t hurt to aerate your lawn by using a garden fork. This is especially helpful in clay-like soils, but won’t hurt any soil type. Fertilising your turf should be part of your regular lawn maintenance. Two or three times a year should be more than enough to keep your lawn looking its best all year round. A couple of months after your lawn has been laid, you can start to ease off on the watering. Eventually, your lawn shouldn’t need much watering at all. If the turf was looked after in its initial stages of developing a root system, it should be fine to only water once to twice a week in the summer, and less during other seasons. 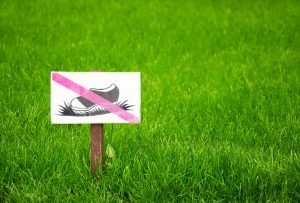 Mowing while the grass is wet is bad for your lawnmower and your turf. Not only does mowing while the grass is wet cause your lawnmower to be susceptible to rust, but it also results in clumps and can cause you to squash and ruin the integrity of your turf, causing damage. If you are looking after your lawn really well, a couple of weeds here or there won’t spoil your entire lawn. As long as you mow regularly, you’ll be able to keep those weeds at bay, and your grass will be healthier and stronger than ever before. Weeds can become a problem when your turf isn’t properly maintained. Keep your lawnmower at a higher setting if you want your grass to look good all year. Grass that is too short is susceptible to having problems and dying off, particularly in summer when the leaf and roof system then become exposed to the harsh heat. Since 1974, Hi Quality Turf has offered a wide range of popular residential and commercial turf varieties to homes and businesses such as Buffalo Grass, Conquest Couch, Empire Zoysia, Kings Pride Buffalo, Palmetto, Sapphire Turf and Kikuyu. We understand the do’s and don’ts when it comes to turf and are more than happy to discuss and educate you on your lawn. We deliver turf supplies within Sydney, Wollongong, Newcastle and the Central Coast. Contact us today on (02) 45 723 666 to find out more. Farm Address: 217 Pitt Town Bottoms Road, Pitt Town Bottoms, NSW 2756. © 2017 HI QUALITY TURF PTY LTD. ALL RIGHTS RESERVED.